The USA will always have a legendary status in the knife world. As a relatively new country (speaking as a European), the bulk of modern designs stem from the States due to a positive legislative and cultural environment. Other countries manufacture knives too, naturally, but the reality is that 99% of people who would EDC a 5 inch+ folder will be Americans. This has meant that designs, materials and manufacturing processes have always advanced rapidly in the States, whilst other countries have churned out their own equivalents, usually a few years later. As globalisation kicked into overdrive from the 70’s onward, traditionally American companies began looking into manufacturing their blades overseas. For a lot of people this was a personal affront – knives are tools, yes, but they can also be a lot more than that. 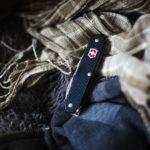 Many felt, and still do feel, that it may be fine to use a Chinese-made keyboard, but when it comes to more personal belongings, like knives, guns, cars, watches – things that are more than mere tools to people – when it comes to possessions that can become a part of your personal identity, many still gravitate toward supporting their own through their purchases. I get that as a pragmatic individual, I am a Brit and thus do not benefit from buying American. That being said, if one day it was announced that the mighty Buck 110 was henceforth to be made in China – Americans wouldn’t be the only ones upset. I know for a fact that I would feel a visceral sense of disappointment if such a day ever came. Why? I don’t have anything against China made knives. In fact, I own and have reviewed quite a number of them over the years. That said, I do believe an American made knife should stay American, and that there will always be something special about a Golden Colorado Spydie that can’t be put into words. Judging by resell value, it’s clear I am not alone in feeling this. As an FYI, I would feel the same if Rockstead or Opinel decided to move to the U.S.A. for manufacturing. I believe a significant portion of their identity would be lost in the process, so this is more of an ideological argument for me, not a matter of national pride, but a matter of heritage and succession. Before I get on with the show, I want to make clear that my bias for certain USA knives stems from both cultural worthiness, emotional significance, and outright performance. 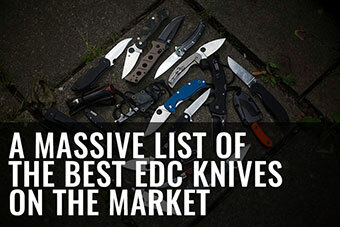 This list is not for the best EDC knife in the world at cutting performance, nor does it favour a specific brand, but rather attempts to celebrate the best (in my opinion) that America offers knife aficionados today. Without further ado.. Yes, yes, I know. It’s heavy and old fashioned, but it’s also a true classic in every sense of the word. As a kid, this was my “grail” knife growing up in Europe. Here, you really don’t see Buck 110s every day, and it has always been, in my opinion the quintessential badass folder. 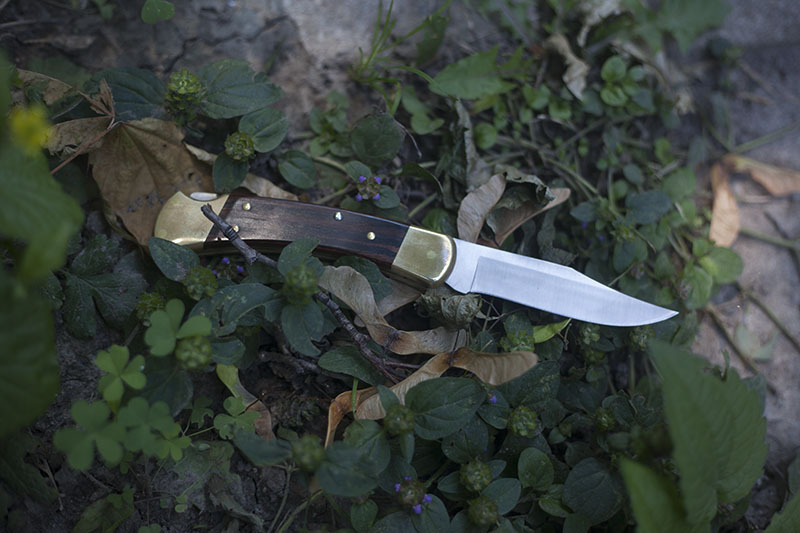 Large bowie blade with hefty brass bolsters: what’s there not to like? I finally bought one as an adult quite a few years ago and even though its performance is non-optimal compared to modern offerings, I still love it and don’t see myself ever letting it go. 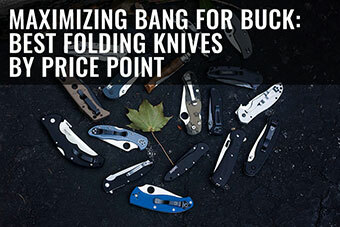 The Buck 110 is a solid and dependable knife in a timeless sort of way, but more importantly, it scores the highest points in the nostalgia department. Some knives you just hold in your hands and simply appreciate, regardless of any empirical metric or performance bias. 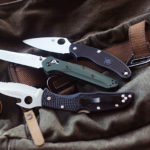 We all know the Para-Military is a “better” knife in terms of hard data; the Paramilitary’s got a superior lock, and a more refined design that doesn’t waste space the same way the Military does. With that said, I love my Millie. It was one of my first “large” knives (I have come a long way baby!) and it will always have a special place in my collection. I like to think of the Military as a 60’s mustang and the Paramilitary as a Nissan Skyline – the Nissan has more tech and more “thought” put into it, but the mustang stands its ground in the parking lot. If you know what I mean. The Griptilian may be the best selling Benchmade knife, but in my opinion, the Osborne represents the brand better. It has a distinct style and a ridiculous amount of blade relative to size. Never thought I would love it as much as I do, but here we are. No surprise to all of you who know me. Case’s Peanut and Sodbuster are more iconic, but the Swayback Gent is the best looking slippie ever created as far as I am concerned. It’s objectively the prettiest knife in my collection, and is responsible for me ignoring all other American slipjoint patterns. Can you blame me, though? Look at this thing! One of the few knives that felt perfect the moment I held it. I seem to be alone in this opinion, but to me the ergonomics fit my hand like a glove. Super nice construction and it’s the reason I overcame my dislike for “assisted” knives. Honestly I haven’t EDC’d this knife very much due to its weight and how cumbersome it is as a general rule. With that said, its brutish unapologetic styling mean I do enjoy owning it. It’s is an odd situation to be in when you own an item that was designed as a hard use tool, but instead has become something one owns just because they like owning it. I reckon quite a few of you share this sentiment. Ridiculous needlepoint. I am to this day shocked that Kershaw produces a knife that no doubt causes many warranty headaches. This is the sort of knife that, if used aggressively, will happily leave a splinter of steel in whatever you are attacking. Fantastic blade, but the Blur is still better looking in my opinion. I bought this knife a few years ago; never reviewed because by the time I bought it – it was already discontinued. I don’t like to recommend something people can’t get easily, although I am sure if you hunt eBay you can snap one up, but frankly this list is about me and what I like so here it is on the list! The Dodo is crazy unique in every sense of the word. The lock is wacky, the handle is weird, and the blade is just plain crazy. I have to give major props to Spyderco for creating a knife that looks like it jumped out of a Dali painting. 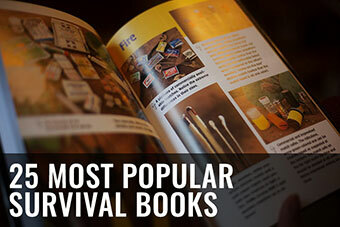 They knew it would never become a best seller, but released it anyway. 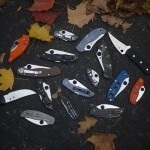 This sort of off the cuff thinking is why Spyderco has so many (well deserved) fans. 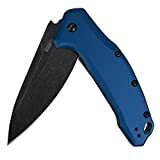 Kershaw Link Blue Aluminum BlackWash Pocket Knife (1776NBBW); 7.6” 420HC Stainless Steel Blade and Machined Aluminum Handle with SpeedSafe Assisted Opening, Liner Lock, Reversible Pocketclip; 4.8 OZ. 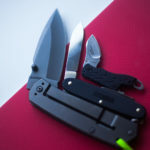 A perfect example of a modern American knife that bang for buck destroys the competition – regardless of where its from. Probably one of the sexiest blades on the market (especially with the blackwash finish) and the sort of construction/design that was well thought out from the ground up. If you’re looking for a budget, American-made folder, this is probably your best bet value-wise. The best looking Emerson in my opinion. that blade is vicious and anyone who owns an Emerson will tell you the ergonomics are fantastic. I readily admit that I was a skeptic but there is definitely something special about Ernie’s designs. I have absolutely no idea why this knife isn’t more popular. It brings a shocking amount of chopping power to the table at the lowest price per weight you can conjure up. 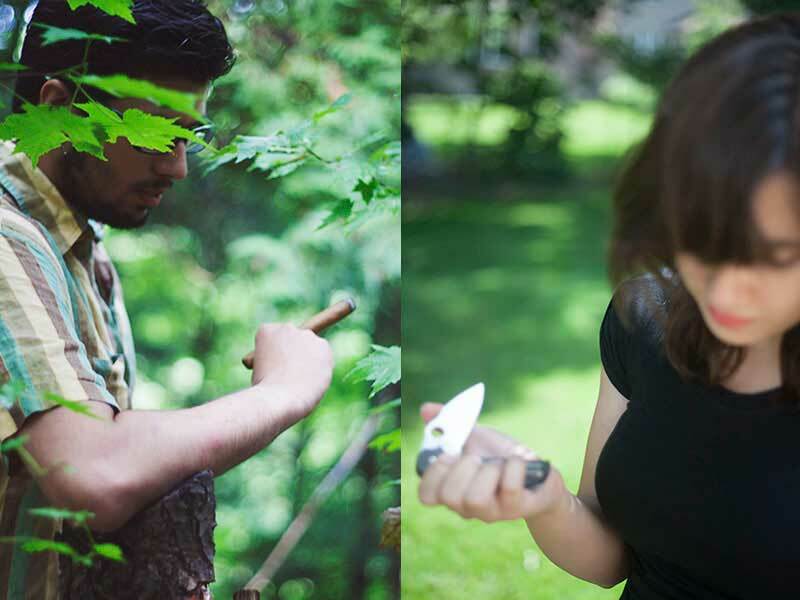 I literally used this knife to chop down a tree: not a sapling – a tree. It took me 3 hours, my neighbour thought I was crazy (and he’s from Newfoundland), but it was a blast and made me appreciate what a 23 ounce slab of carbon steel can do to organic matter. 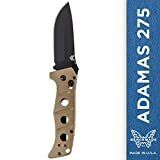 I have used this blade more than any other in the outdoors, and whilst some knives are more performance focused than the Raider Bowie, that doesn’t change the fact that it’s a beauty (in a monster truck sorta way) with an obscene amount of power. It should get way more recognition than it does, but sadly, doesn’t look like that will happen. No idea why. If I had to design the perfect knife (for me) I think it would look something like CRKT’s Hood Camp Knife. Still haven’t reviewed it, but it’s coming. Super nice grinds with the optimal blade stock thickness for wilderness use (my opinion). It’s nice to see large, wide bellied performance blades instead of the 1/4 inch+ thick prybars we see so often. A great modern “do everything” field knife. I began to appreciate Bark River Knives watching virtuovice put them through their paces in his many videos. Fantastic fit and finish with a very distinct style, and on top of that (as far as I know) Bark River is the only company outside of Fallkniven who’s made full convex production blades. The choil of the ESEE 6 has always bothered me. Maybe it’s because I am used to working with scandi blades and I don’t like the idea of a “wasted” edge, but there’s no denying the quality of these Rowen MFG-made blades. Probably the best warranty in the business (no questions asked, lifetime) with lean, clean grinds that’s all business. 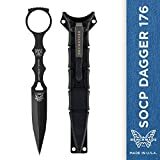 This may seem like an odd recommendation, but I think the Benchmade SOCP Dagger is probably the best designed “last ditch” knife ever made. The knife features a blade & sheath that’s all business from the ground up, and ultimately I think it’s the sort of thing that really separates the American made stuff from the rest. Bad intent all over it. Possibly the most famous fixed blade in the world. In terms of sheer performance, the Ka-Bar USMC has been eclipsed by modern competitors, but it’s nonetheless a fine blade for all tasks one could need a knife for. 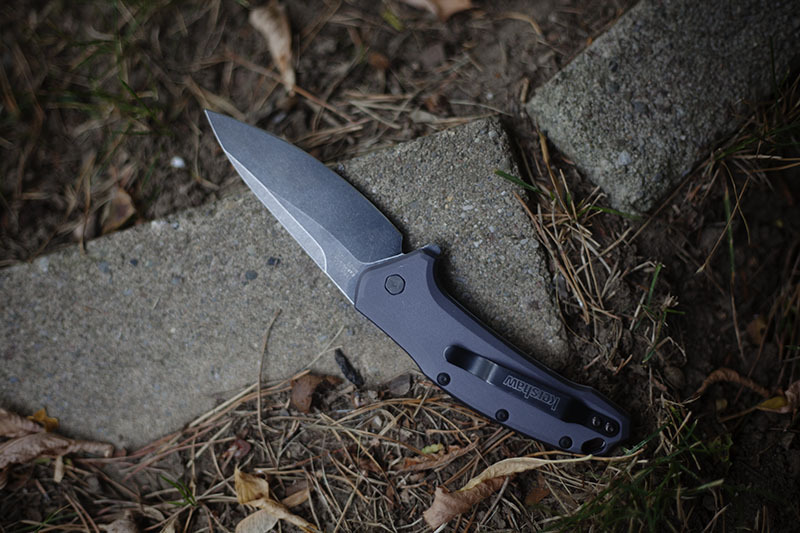 Unlike modern “tactical” knives, this puppy has the lineage to back up its name. As far as I know, these are made by Bark River, and it shows. Super crisp lines with great convex blades. This is as close to a Randall as I will get, and I will have to make peace with that. If I had to pick the representative of an American knife, a big clip point bowie would be my choice. I will most likely never own this iconic knife (again, I have sorta made peace with that fact), but I would be willing to trade a kidney and possibly part of a liver for one. 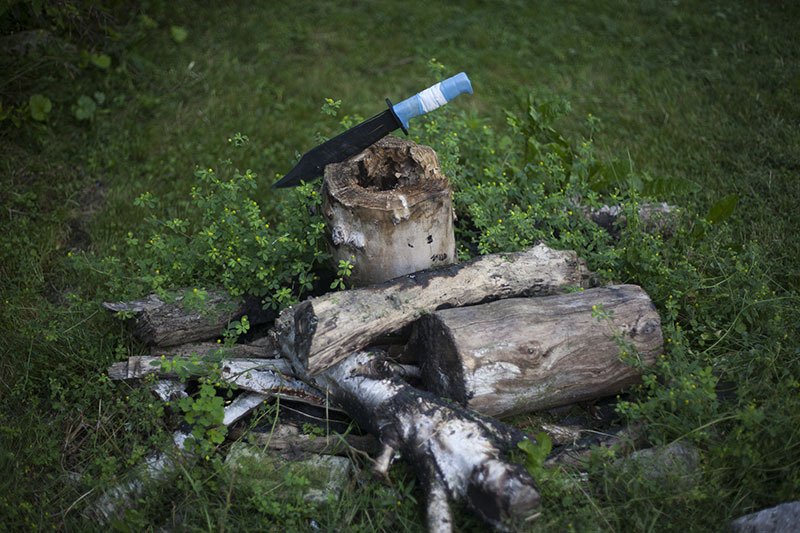 It’s the sort of knife I saw in outdoor magazines as a kid and always lusted after, and I am not alone in this. Very hard to get with a waiting list that rivals custom knife makers. 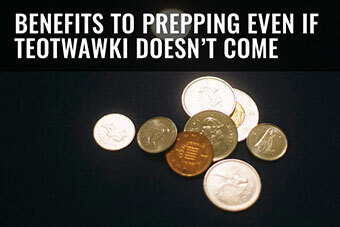 Your best bet is stalking eBay and even then, good luck. 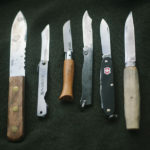 Your Opinion: The Best American Made Knives? Anything I left out on this list? Anything up on here you’ve had or handled before and don’t think should be up here? Let me know what you think are some of the best knives currently made in the USA by leaving a comment down below. Great article. I got a Randall 19 in 4 mos. Randall has a list of dealers and each dealer gets two knives per month. I called Randall and they gave me the names of several I should call. I called a man in Alabama. He charged the retail price in the catalog. He asked what I wanted… blade width, type of steel, handle material etc. 4 months later in my mailbox I found one of the baddest most beautiful knives ever! It cost me $450!!! Stag grip too!! Very cool, always wanted to have a Randall! Maybe one day. Geart blog is the Ka bar full tang? Its a stick tang, which is good enough for me as far as toughness goes. 1. Understand that many were designed as defensive tools. This means that those so designed are not sharpened like sushi knives at the factory. If you don’t know how to sharpen a knife to your personal satisfaction, then don’t purchase a knife that started as a defensive tool. 2. The overall length of the blade should be in the range of 5 -5.5 inches. Too short and you are kidding yourself about the capabilities. Too long and it will be so heavy, you will not carry it. 3. Always factor in the cost of a decent sheath. Many factory sheaths are garbage. Many “decent” sheaths cost more than the knife itself. Budget – The current iteration of the Ontario air force survival knife with the rubberized cross piece. 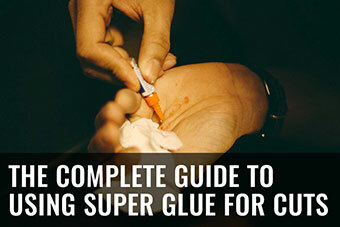 Cut off the top of the cross piece with a hacksaw or a sturdy pair of scissors. The bs about it being not full tang is meaningless. The design has not failed in the field according to the air force instructor who saw the same training knives used hundreds of times. Ideal – Ontario TFI. Proper length, balance and a sheath so decent from the factory that you will wish it fit the other Ontario knives. 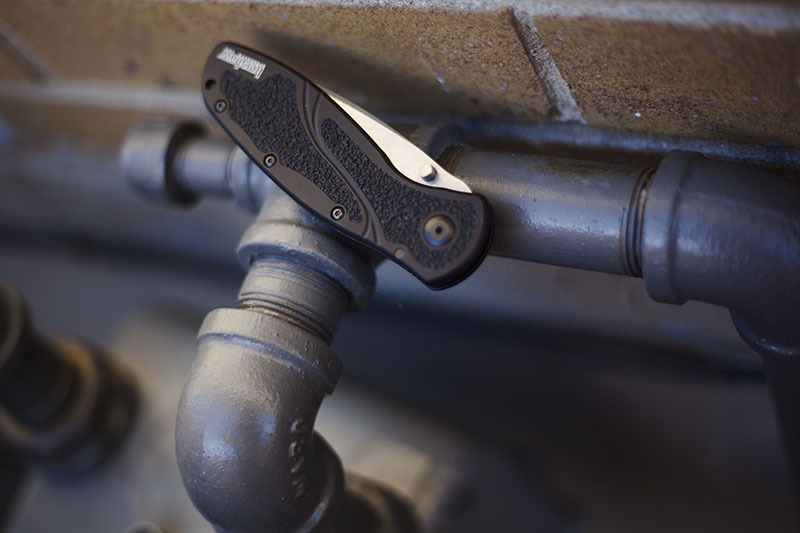 Gentleman – The Fallkniven Air Force survival knife. 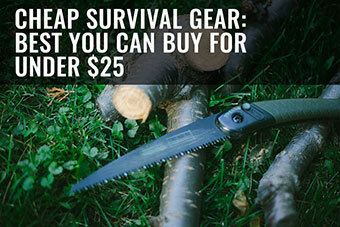 This is the only survival knife with a grip that was designed to go with a glove. I call it “Gentleman” because that ugly factory sheath (with the sheathed knife) will fit into the front pocket of a Brooks Bros semi-custom business suit smoothly and comfortably. 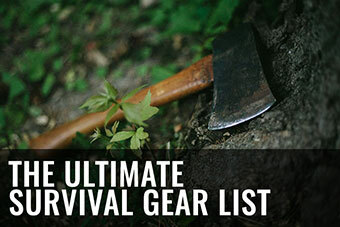 Try doing that with a Bowie knife or one of those aftermarket custom sheaths for any other survival knife. Oh. At one time or another, I have probably owned many of the fixed blades referenced in this forum. Sure, an $11 Mora will do 90% of what the above referenced knives will do, but it is not a defensive knife. And sure, a Schrade knife in the $35 range will do 90%. 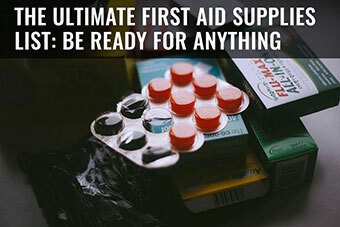 However, you may be compromising too much on a sheath. 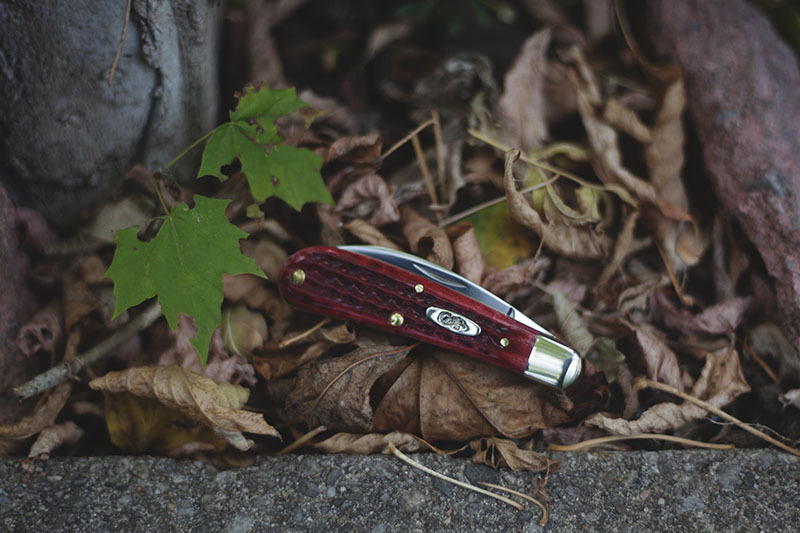 You won’t be able to carry a Schrade survival knife in a sheath in a pocket in your Brooks Bros suit. Either series is fine to throw one in a fishing tackle box/car trunk/a relative’s home/leave in the hunting cabin. I find it interesting how much people harp on about stick tangs. I have used and abused many Mora’s and have never had one fail, on that same note, I have shattered full tang knives whilst doing what I consider “standard” tests like batoning. 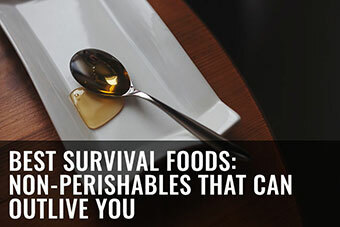 People need to stop obsessing over perceived benefits and actually test knives! I have yet to review the Ontario AFSK but it has been suggest many times so I reckon I should get to it. What do you think of the ergonomics? I jotted down all your recommendations, Fallkniven looks dope but a touch out of my budget right now (sadly), Ontario TFI looks good though- £125 here in my neck of the woods. Eugh, I should have been born a Texan. 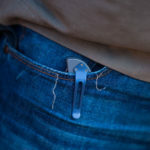 My Buck 110 is my nightstand knife and it goes into a jacket pocket around the acreage. Something about it. It is too much around town, honestly it was a knife created in an era where there was work to be done outdoors, and society to some extent still agrarian. It’s a polished wilderness item, maybe even a trail knife. 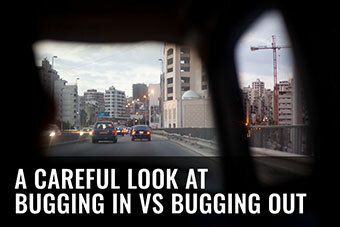 To be seen as a commuter or a comfortable item within suburbia or cityscapes would be an invitation to defend that we ourselves are a product that belongs beyond the outpost, or perhaps of civilized mores. Nowhere in town would anyone be comfortable witnessing the baring of such a fang. Aye, society has for sure changed significantly- at least when it comes to the social perception of our tools. I doubt any knife but a slipjoint or swiss army knife would be received well here (in the UK). I agree with the descriptor of “polished wilderness item”. So true, its definitely a working mans blade but at the same time is so refined and (for the lack of a better word) “pretty” that its hard to pigeonhole into just one category. 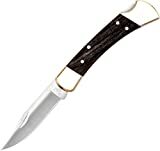 I am surprised that you have it as a nightstand knife though, I would have imagine you would have a fixed blade of some kind! 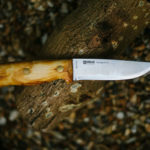 For a practical fixed blade woods knife, the 105 Pathfinder (I think) is just about perfect. The only minor complaint about it – the handle is a bit thin. Makes it more compact, but a handle diameter that you can get a real grip without digging fingertips into palm of hand makes for a stronger work grip. American folder – so many good choices, hard to make up mind for that. Thank you for the post. I always found the Pathfinder blade to be too anaemic for my tastes, then again I have yet to own it (just handled it in a store). How does it work out in practise? Do you find that there are some things you can’t do where a heavier blade would be fine? And thank you for commenting Kristopher! 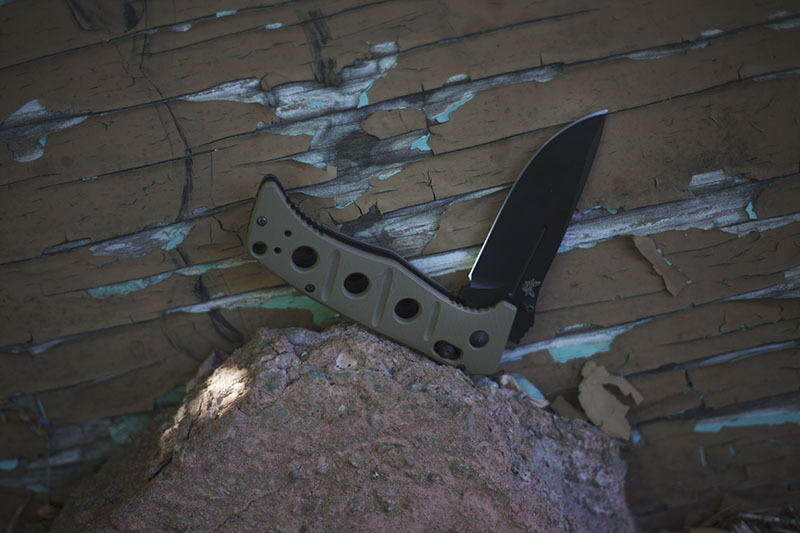 Frontiersman is a badass knife for sure- like a 120 on steroids! My wife bought me the Ontario Air Force Survival Knife and it’s my favorite fixed blade. It’s just the right size, the hex shaped pommel is beefy, it can be sharpened razor shop (I’ve got a scar to prove it). 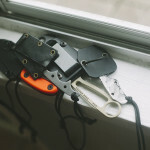 The sheath comes with a small stone and can be attached to gear in many different ways. The bowie shape of the blade is very menacing looking if it came to using it for self defense. I have a big ka bar marine knife but the Ontario is is the knife in my 3 day pack. It’s just right. Second time I have read that knife recommended this week! What do you think of the handles? Do they feel rough to the touch? If I buy it to review it, it will be without seeing it so I am slightly hesitant. Sure. The handles are stacked leather similar to the Ka-Bar with slightly deeper grooves. I find them very comfortable. I’ve worried about rot, but I’ve had it for 15 years with no noticeable issues. 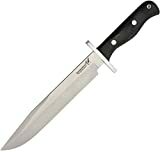 The Ontario fixed blade Bowie is a fine knife indeed, but if I’m chopping down trees I like their SP Survival Machette better. My Ontario fixed blade knife of choice is the new Air Force survival knife, great size, good build, and won’t bankrupt you for a fixed blade. Unfortunately my folder knife of choice has always been a Victornox hunter series knife. The extra tools and construction can’t be beat in my book. JMHO as I’m no knife expert. I haven’t handled their SP Survival machete, what do you think of the serrations/saw tooth pattern on the spine? Nothing wrong with Victorinox knives, I absolutely love my Alox Pioneer (great EDC slipjoint)! Thanks for dropping by mate, I appreciate it. 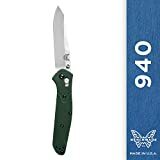 If you get a chance, please review ANY # of Chris Reeve hollow handle knives, Idaho, USA. His are made from 1 piece block of steel. No tang weakness. Sadly, I purchase 99% of the items I review and unless Chris Reeve wants to send me one, I don’t think I will be able to justify the cost. :( I really want to though!